Mrs. Plant with Lindsay Nixon (The Happy Herbivore) on iTunes! I was asked to be a guest on Happy Herbivore's Meal Mentor podcast to talk about my plant-based journey and about how we transitioned our dogs to a plant-based diet. It's out today on iTunes! 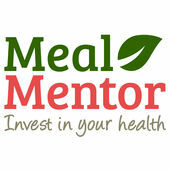 If you search "MEAL MENTOR" on iTunes. I'm on this week's podcast! Let me know what you think! Or, you can go directly to Lindsay's website at www.happyherbivore.com (link at the top of the home page in the orange bar). Loved this episode and learned a lot. I am curious if you have any experience with fleas? We can't get rid of them no matter what and our dogs are suffering. Melissa...I am not a proponent of medications, as you know. However, I believe it may be necessary for you to (temporarily) put your dogs on Trifexis until you can beat the flea issue. Also, you may have to treat around the inside and outside of your home to get rid of any fleas or eggs that are infesting there. Then, once you get the problem under control, you should think about making their food. It helps tremendously with health issues...just like it does for humans. How many dogs do you have, what breeds, sizes, etc? When did they become flea-infested? How do you know for certain it is fleas. Would love to hear back from you.